Bon Vivant turns ONE! Yeah, you friends have helped me run this event so successfully by sharing all your wonderful recipes at my space. So big THANK YOU to all. I never celebrated my blog-anniversary last July because I was busy with... well what can I say life! There was so much going on at that time, celebrating my little creation was way out of question. Then there was another milestone when I posted my 100th recipe to the blog. Though I quietly rejoiced with my family, I didn't make any hullabaloo about it either. When I think back to the time I started my blog, I didn't think I would come such a long way. So in this month of February, my birthday month, month where everyone seems to be in Love, month when Bon Vivant event is embarking on another journey, I decided to celebrate! Coming for this month's Quixotic Fixes, let me start by explaining the word itself. Quixotic means the most Idealistic, Romantic. The word sounded so exotic that I wanted to use it. So for this month of February when you are cooking it up high notch for your loved ones, I welcome you to join me at Bon Vivant for the celebration. Link up your Valentine's favorite's using the linky below. Wait a minute, didn't we talk about celebration! So what's the celebration without any gifts right? No, I am not asking you for one, I am planning to send you one. 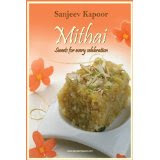 It will be one of my favorite Chef's "Mithai" book. Yes, it's none other than Master Chef Sanjeev's Kapoor's book. This is not sponsored by anyone but me. It will be from my collection. It contains extensive list of some of authentic Indian sweet recipes. From Mathura ka Peda, Jalebi to burfi's. So what are the rules you ask? Well, it's everything that was in previous Bon Vivant's plus some more. Read on and happy cooking. ~ Leave me a comment about which dish from Sumee's Culinary have you tried or intend to try. ~ Like my Facebook page, join through GFC and/or follow me on Pinterest. Leave me a comment about the same. ~ Non-bloggers too can participate. You can email me all the details of recipe or post it on my Facebook page. ~ Winner will be chosen randomly from the inlinkz list below. I will choose one in first week of March. ~ If you are unable to respond to me with mailing address, I will choose another winner. I need to get reply within 48 hours. ~ Multiple entries are allowed. Usage of the logo is a must. ~ Linking back to this announcement page is mandatory to get the word out. I have noticed some of them are not back linked. I will have to promptly remove them if not linked back after one notice. ~ Vegetarian and non-vegetarian recipes are allowed. No pork or beef ingredients please. ~ Non-bloggers can email the recipe along with a picture of the dish to the above email address. I will link them up. ~ Favorite Bon Vivant of the Month" will be chosen from a recipe linked to Bon Vivant in this month. congrats for everything and I am already starting sending entries. Happy hosting!!! am surely sending some entries!! Linked my recipe here. happy hosting. love that word too - never heard it before. Just linked up a recipe perfect for any Valentine! Liked your facebook page. would like to try your chocolate covered marshmallow hearts. Linked in my recipes here. @SumeesCulinary. Simple theme. Powered by Blogger.